A steam lorry used by George Park & Co. of Southsea. Homepage. This page: George Park & Co. Ltd operated this steam wagon in and around Southsea during the 1920's. George Park & Co. Limited. 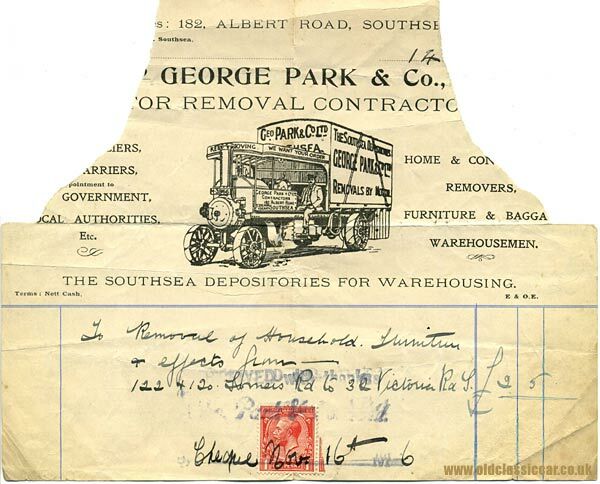 Sadly this old invoice has suffered over the years, but the illustration of George Park & Co.'s steam lorry more than makes up for this item's distressed state. The firm operated from a base at 182 Albert Road in Southsea, and some digging suggests that George Park started out in the 1880s as a greengrocer, before opening up a removals business with 15-20 horses on his books by 1901. His firm occupied various premises on Albert Road, and other addresses as the 1920s and 1930s came and went. Records suggest that by 1933 he had 100 lorries to his name, so it must have been a very prominent business in the Southsea area. The text on this invoice hints at the size of their operation. This particular billing was made for the removal of household furniture and effects from 122 & 120 Somers Road - interestingly this invoice, for removals by W. Boots & Co., also refers to a job done for the occupant of this address, but in 1923, whereas I think Park's job was undertaken in 1926 when the customer was moving house to 32 Victoria Road. The vehicle illustrated on this old invoice looks like a Foden steam lorry to me, can anyone confirm or correct this? It was registered as M3966. "M" was a Cheshire series used from 1903 to 1920 - the Foden works was located in Sandbach, Cheshire, so perhaps if this was a Foden lorry, it was registered by the factory prior to being sold to the South. A surviving Foden lorry registered M4673 dates to 1913, so this would suggest that the lorry on Park's invoice is most likely of 1912 or 1913 manufacture. A few years after adding this page to OCC, Bob dropped me a line. While researching his local history, he stumbled across a grainy image of steam lorry registration M3966 in action. Searching online for information about it, he found this page. The lorry is shown transporting an underground fuel tank between two airfields, in the years following WW1. At that time, it was owned by J.W.Lance Carriers. Note how the legend "WE WANT YOUR ORDER" can be seen on the cab above the driving position, in both images. Thanks for sending it over. More motor-trade related papers can be found in this Motoring Collectables section of the oldclassiccar site, including one for the removals business of Mr Humpherson of Winton, Bournemouth.